1. Top of the Falls: Falls off the top of the Falls is almost always fatal. In 2004 a girl did fall off the top of the Falls and survive. But, she is the only person who has survived a fall off the top of Kaaterskill Falls. 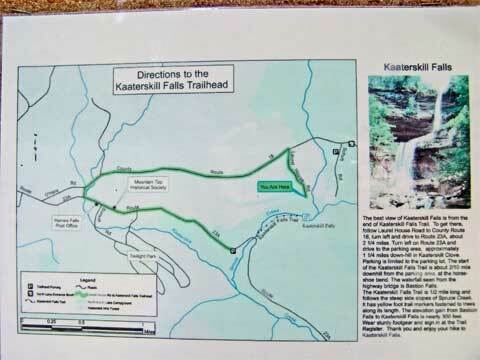 A dog did fall off the top of Kaaterskill Falls in the 1800's and did live. All other falls have been fatal. The upper part of the Kaaterskill Falls is 167' high. The lower section is 64' high. 2. Fall off the top of the trail: When hikers get almost all the way up the trail to the top, the trail splits into two different trails. The logical route is the lower trail. This lower trail is extremely dangerous since it is very close to the ledge. The upper route is safe. But, most people take the lower route. Many falls have happen here. 3. Slip and Fall on the trail up: Some hikers fall on the very steep trail to the top, and tumble down. Falls in this section usually result in injuries and not death. 4. Fall off the lower falls: Some hikers try to cross the water at the top of the lower falls and are swept over the lower Kaaterskill Falls. This can be fatal. The lower falls are 64' high. What many people do not realize is that they can get to the top of the Falls by driving up there. This is the best and safest way to get to the top of the Falls. The trail could easily be fixed to prevent many of the fatalities. There are people now attempting to get the DEC to allow a change in the trail to the top. Mike...When do you think that the DEC will allow us to change the trail? It will probably take quite some time to get approval. Here are some more recent signs put up by the DEC in the Kiosk. The only problem is that very few people look at the Kiosk. Better then nothing. It's a start. I don't think I have seen anyone look at the bulletin boards (kiosk?). not sure how much good it is going to do. Would it be better if people were encouraged to go to the top of K-falls from Laurel House Road instead of trying to scramble up the dangerous non trail steep slope? This picture and map look as if they are posed at Laurel House road...is that where they are from? I believe that the maps are also on the bottom at the kiosk (bulletin board). Few people look at the board, so they are of limited value. But, still better then nothing. 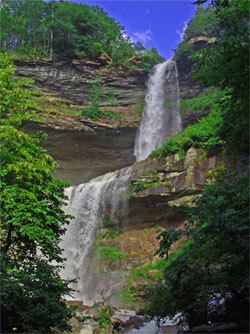 We are hoping to get some Water Falls Interpretor program going. That would help a lot more. It was my father who fell in this accident and wanted to say that three weeks out he's alive and well and on the (slow) road to recovery. There were many hikers out there that day who helped him, we have been learning about how much. If you helped and you're reading this: thank you thank you thank you. Very sorry to hear about your Father's accident at KF. We wish him a full recovery. Many are killed here every year. A few lucky ones live. There is a large group of people who are trying to change this area to reduce the number of accidents and deaths. You are welcome to join this group to try and get the DEC to fix the trails so this will not happen again. 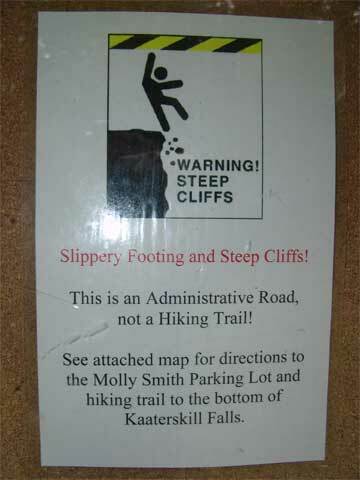 Some of the more experienced hikers would like to create a new trail that would be much safer.